A few weeks ago, I had occasion to scan the last AD&D adventure I wrote before I started work on the game that would become Warhammer Fantasy Roleplay. You can find it here. The adventure was called Find the Lady, and it was published in issue 2 of Paul Cockburn’s AD&D magazine GameMaster Publications, which came out in December 1985, shortly before he joined Games Workshop. Paul started GM Pubs after the closure of Imagine magazine and the rest of TSR UK’s publications department; it was written by various Imagine regulars – and several former TSR UK staffers – and lasted for five issues before Paul took over as editor of White Dwarf. Like Imagine, GM Pubs only bought first rights, which is why I feel comfortable making it available online now. Rereading it thirty years later, I can see it has many of the qualities that would later become characteristic of WFRP: in fact, it wouldn’t require much work to covert it to any edition of that game, with the action set in Altdorf, Middenheim or Marienburg rather than the Pelinore setting that was born in Imagine and continued in GM Pubs. Three years ago, Coop over at the Fighting Fantasist blog made some very astute observations about Pelinore and the development of WFRP, and Phil Gallagher and I both weighed in with comments. Like many of the early Enemy Within adventures, Find the Lady is primarily a city investigation. As with much of WFRP, I had too much fun creating colorful NPCs. I had been playing a lot of Bushido in the few years before I wrote it, and had fallen in love with the trickster fox-spirits called kitsune. I had also been running a first-edition Call of Cthulhu campaign which involved a great deal of investigation and NPC interaction and very little combat: after all, taking a D&D approach to Call of Cthulhu combat made for very short adventures! Both of these games were an influence on Find the Lady, and of course Call of Cthulhu would be a significant influence on the Enemy Within adventures. Looking back, it’s easy to see Find the Lady as an intermediate step between AD&D and WFRP as far as my own work is concerned, but it’s also a reflection of roleplaying in general – especially, I think, British roleplaying – as it stood in the mid-80s. Several London-based fanzines led the “rolegaming” movement, which emphasized character interaction over combat and decried commercial success – including the success of WFRP – as somehow having Betrayed Art. Less vocally, roleplayers across the UK were drawn to Call of Cthulhu for the way it supported options other than combat. AD&D was still in its first edition at that time, and had a notable lack of non-combat skills. Warhammer, of course, was – and remains – a miniatures combat game, so it is perhaps surprising that its roleplaying spinoff should have taken such a different course. Partly it’s because the WFRP combat system turned out to be so deadly and there was little time to fine-tune it, but in large measure, I think, it was a product of its time: a time when Call of Cthulhu had shown the way, and other tabletop RPGs were looking beyond the dungeon. Find the Lady is another sign of those times, and although it’s not as polished as it might be, I hope you enjoy it. And they looked great too. I’m downloading that action. Thanks Graeme! The Doomstones seems to be another D&D/WFRP crossover, but we may have already had this discussion before. Great article, GD. Naturally, whatever rights I held to this are long lapsed, so have fun with putting this out there again. If it didn’t feel so old hat, wouldn’t you just love to take another run at it all? Doomstones is pretty much a Dungeons & Dragons crossover. Certainly James Wallis has said as much. In the meantime, thanks for this (and the link). I liked both Imagine and its sequel very much. Now I will have to avoid looking at this when i should be working. Doomstones was originally a D&D series called the Complete Dungeon Master, published by Beast Enterprises if memory serves. Freelancer Brad Freeman converted the stats to WFRP and I edited the text to make it fit the setting. Most of Flame’s output worked that way. We were very seldom allowed to do anything original. Thanks for posting this. I look forward to reading it. You’re correct about CoC and WFRP showing a different way to do things to many role players. When I was introduced to WFRP at the age of 16 it blew my mind in terms of how it almost forced the players and GM to deemphasize combat. Mark, what is most fascinating about that is how, at the same time, other guys at the Studio were developing Warhammer Fantasy Battle around the Prime Directive – sell more miniatures. The one thing WFRP as it turned out could never do was sell heaps of metal and plastic – so it’s amazing that Bryan Ansell let it go that way. The first printings of The Enemy Within, Shadows Over Bogenhafen and Death on the Reik had miniatures-deal inserts. I remember some grumbling over the goblin wizard in a ballgown from DotR, the subject being not considered worthy of a Citadel miniature. And very few role players would have shelled out 100 pounds or more for miniatures to go with an adventure. My memory is that after the first sales figures came in for the 40K lines, it became quite a bit harder to get a green light for a new WFRP title. I’d forgotten about the miniatures ads, but I don’t think there were ever great expectations on their sales. I recall that I was told not long after WFRP launched that I didn’t understand miniatures, and Rick was being encouraged to create real demand for bigger armies in WFB. But you are undoubtedly right that it was the 40k cash-cow that finally turned the company against role-play. I am currently running ‘Find the Lady’ in a 1e campaign. In fact I’ve run the Beacon at Enon Tor by Mike Brunton and Graeme Morris, A Box for the Margrave by Mike B, Jack of all Trades by Roger Hall and Graeme M and A Murder at Flaxton by Micheal Heaton so far, all to the backdrop of Richard Green’s Parsantium city background. Other adventures/scenarios in the pipeline are Gollush Glum Drum’s Mystical Garden and the Tomb of Qadir (Tortured Souls), Night’s Dark Terror by Jim Bambra, Graeme M and Phil Gallagher, The Sentinel (and The Gauntlet) by Graeme M and The Guardian of the Key to Time by Mike B and Paul C. The latter sets up the main thrust of the rest of the campaign, though the PCs have already got themselves mixed up with various power groups – I have set up a campaign journal on the Dragonsfoot message board. 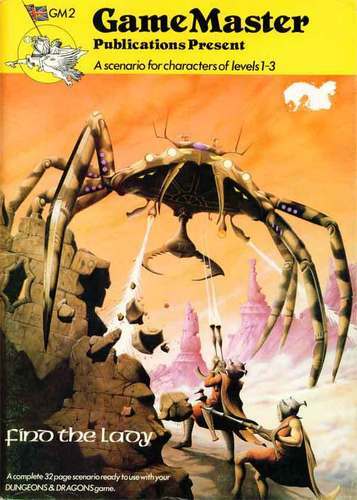 In other words I’m a fan of early UK D&D writing, though I will add Steve Kurtz and Wolfgang Bauer adventures to the mix later on – their al-Qadim stuff is also excellent. It is important to acknowledge the authors of great role-playing experiences, as it is authors of books in my opinion. Hence in my campaign journal I always mention the scenario title and writers. One problem is I can’t track down the authors of Tortured Souls adventures, anyone know how to do this? As far as I remember, all (or at least, the overwhelming majority) of Tortured Souls was written by Simon Forrest and Basil Barrett. I do know that they co-wrote the Complete Dungeon Master series between the two of them, and I believe the same is true of the magazine-style Beast Entz publications. I’m leaving Sethotep for an al-Qadim campaign………and will adapt the Taking of Siandabhair for Parsantium. All have been run before and I have fond memories, thanks. Someone has put together a Pelinore web forum, with links to various resources. If you’re a Pelinore fan, I’d recommend checking it out. It’s early days yet, but this could grow into something really good. Thanks, Graeme! I’m a big fan of your work, especially the early days, your trove of pdf articles is a great gift to us old-school gamers.